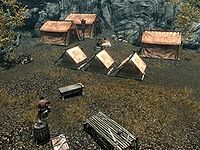 Rift Imperial Camp is a small Imperial camp in the Rift, located south of Ivarstead and a short distance west-southwest of the Ruins of Bthalft. The camp is normally commanded by Legate Fasendil, except during the related quests at which point Legate Rikke will assume command. It is a very small and compact Imperial camp consisting of a central campfire with a cooking spit hanging over it, around which the rest of the camp is arranged. Several soldiers are sleeping, others sit by the fire and more patrol around the camp and surrounding area. Due to the proximity of the Ruins of Bthalft there are regular skirmishes between the Imperials and bandits located there. To the northeast and southeast of the camp there are barricades, while to the northwest and southwest the camp is butted up against rocks rising above. South of the campfire is the commander's quarters containing a single owned bed with an end table beside it and an unlocked chest at the foot of the bed. 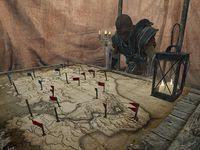 To the right of his tent is the command tent, containing a table covered with a tactical map of Skyrim showing the current allegiances of settlements and forts, and an end table. This is where the commander (usually Legate Fasendil except during the related quests, when Legate Rikke takes over) will spend most of their time, studying the map. To the west is a wood chopping block, while to the north is the medic's tent, where the sick and injured are treated. This tent contains three bed rolls and a small table holding a random potion of health and a random potion of healing. Outside is an alchemy lab and some barrels. Behind the hospital tent are pickets for two horses. To the east of the campfire are a row of three small tents containing unowned bed rolls. Behind these is the workstation for the Imperial quartermaster. It consists of an anvil, a grindstone and a workbench, with a wooden table covered in various iron and steel weapons and armor. More are behind, on a barrel and some crates. All of these items are owned and taking them is considered stealing, and none appear in the quartermaster's merchandise. He buys and sells weapons, armor, ores and ingots. Any time The Rift is controlled by the Imperials this camp will not be present. As long as you aren't a Stormcloak, you are free to sleep in the small tents and barter with the quartermaster. One corundum ore vein is located among the rocks southeast of the camp.